Recently, the “Oscar of real estate”, the International Property Award | Asia Pacific region had announced the winner list. As the representative designs of HWCD, Jing'an Prime Land, Cofco Ocean ONE, COB Ningbo Bay Sales Office and the Fusion Palace of Financial Street came to the fore among the fierce competition and won the highest honor in China of the International Property Award | Asia Pacific region. 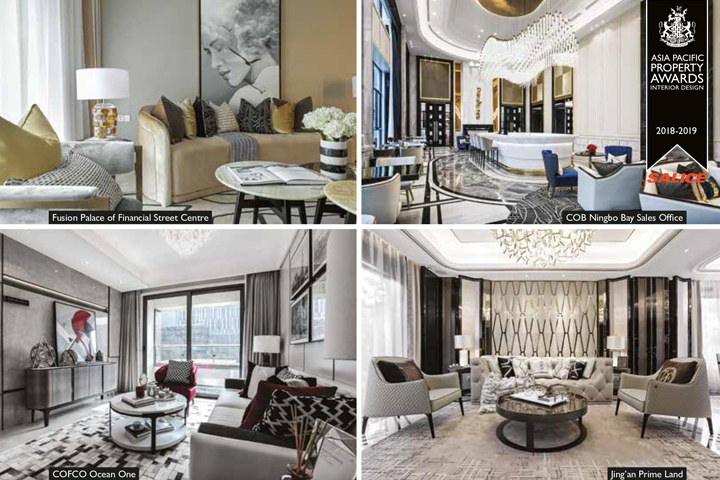 Among all, Jing’an Prime Land, Cofco Ocean ONE won the Award in the Interior Design Apartment category for China; COB Ningbo Bay won the Award in the Office Interior Category for China; and the Fusion Palace of Financial Street won the Award in the Leisure Interior Category of China. The International Property Award is undoubtedly the most honorable award in the real estate design industry and it has conducted more than 20 rounds of competitions in the past. The award targets international professionals in residential and commercial real estate industries and celebrates the highest leveled accomplishments in property and real estate industries. The award segments according to regions and include areas such as Asia Pacific, Africa, Canada, Europe, Britain, America and more. Candidates enter into their respective regions of competition and will be judged by an experienced and professional team that covers all fields within the real estate industry. Companies listed as winners will be invited to attend the fabulous award ceremony and be granted the most prestigious award signature. HWCD has brought to the public “Jing’an Palace”, an international community designed for the Shanghai future CBD. It has continued the classical elements and details from old Jing’an Palace and recreated into a futuristic yet classy living experience with a contemporary aesthetic perspective and modern lifestyle. The whole Jing’an Palace selects all furnishings from the best of Germany. It is allocated the innovative Dornbracht hardware, the time-honored Villeroy & Boch sanitary appliances, the high-end Miele kitchenware, Darkin entral AC system, Honeywell air control system and even a full coverage underfloor heating and soft water filter. With the twelve “Excellence Plus Bespoke” standards, it forms a Shanghai city cover shot and opens an unprecedented future of dreams. Cofco Ocean One sample room is one the three Cofco trilogy, a design presenting both modernism and new age lifestyles. Strolling at the romantic front beach, this is where you can have a gorgeous encounter with London, Milan and New York. COB Ningbo Bay sales office is dedicatedly designed by the HWCD designers. The classical city deco-elements have been blended into the design in a subtle way. Embraced by the sparkling metallic textures, its symbolic stone mosaics and vivid decorative lines make it a building of profound city charm. Its delicate furniture texture and design details on the other hand, display a comfort, romantic sentiment. Fusion Palace of the Financial Street is born at the Suzhou River side and is given an inherited energy of fashion and freedom. Stepping into the sample room, you will be drawn by the outflowing artistic sentiment. Every distinct space depicts a story of its own. The space is given spirits and emotions and thoughts flow at every corner. What a luxury and charming scene. The diversified design inspiration brings a fashion aesthetic texture and delicate bespoke craftsmanship into the fluent metallic lines. The charming fabric texture embraces the natural, refined marble pattern and becomes a visual focus. The throbbing heart of fashion beats, forms a symbol of space and brings an enthusiasm to fashion into each details of the space.